This page gives information on wiring various Din connectors for various purposes including MIDI (Musical Instrument Digital Interface) connections. 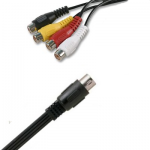 Leads Direct sell and manufacture cables using a wide range of DIN standard connectors which you can view and purchase, the most common of these are MIDI and Keyboard and Mouse leads and cables. DIN is short for Deutsches Insitut für Normung eV, the standards setting organization for Germany. A DIN connector is a connector that conforms to one of the many standards defined by DIN. DIN connectors are used widely in Hi-Fi, Audio Visual, Music and in Computers. For example, the keyboard connector for a PC is a DIN connector, as is the connector on a MIDI lead and an S-Video lead. The 2 pin din is not a round connector like the more common 3 to 7 pin varieties. 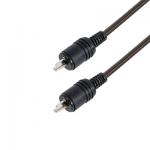 Leads Direct can supply both 2 pin DIN speaker leads and if required the connectors to make your own. If you prefer, we can make Custom Leads to your specific requirements, so that you get exactly what you need. Vintage manufacturers that commonly used this audio configuration include Amstrad, Bang & Olufsen, Classic, Marantz, Naim, Quad, Sanyo and many others. DIN connections are no longer used for audio connections, with all modern Hi-Fi equipment having moved to using the RCA Phono pair as the connecting lead. However, Leads Direct can supply a wide range of Custom Leads to suit your audio connection requirements. Our friendly team will help you to determine your needs if required. Our Standard and Oxygen Free Midi leads and cables are manufactured using this pin layout. Note that a few Midi products use one or two additional pins for their own purposes, and which case you should use a Standard 5 pin DIN pinout instead. There is no problem with having the extra connections if they are unused. Our Moulded Midi leads and cables use this layout with all pins connected, so they can also be used for Audio and Musical applications. DIN 41612 standard describes multipin connectors that are often used as ‘backplane’ connectors, provding data transport between network equipment, such as routers and switches. The connectors may have up to three rows of contacts, each with 16 or 32 columns, which allows for 16, 32, 48, 64 or 96 contacts on a 0.1 inch (2.54 mm) grid pitch. The female connectors have IDC contacts rather than solder contacts, which helps to prevent heat damage to backplane equipment during installation. 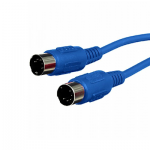 A combination version of the connector (known as Type M) allows for a range of additional connections including RF, signal and power connections to be included in the same connector. If you are seeking information on Din wiring but cannot find it here, please email info@leadsdirect.co.uk and we will try to both answer your question and make sure that the information is made available through these pages for future reference. Leads Direct makes great efforts to provide accurate and complete information. However, portions of the information contained in this website and any documents viewed on it or downloaded from it may be incorrect or not current. Any errors or omissions should be reported for investigation and correction. The information provided in any documents whether on our website or otherwise is provided "as is." No warranty of any kind, implied, expressed, or statutory, including but not limited to the warranties of non-infringement of third party rights, title, merchantability, fitness for a particular purpose, and freedom from computer virus, is given.